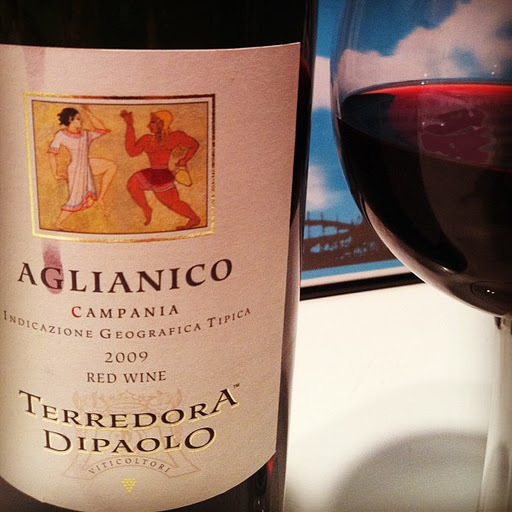 Another find from the wine tasting last weekend was Terredora Di Paolo Aglianico 2009. The petite taste that I had was quite dry which I’m not customarily a fan of, but not only did I see a bit of promise in it’s easy drinking potential, with my background in ancient art, I am enticed to any ancient looking representation found on any item. Therefore I was instantly hooked by the label, which portrays some manner of Dionysiac ritual involving dancing and drinking [incidentally, two of my favourite activities]. At the tasting they recommended letting the air get at it for a bit as it is on the young side, so I happily employed my aerator. Translucent garnet with brick red around the edges, there was dash of raisin intermingling amongst the enduring alcohol aroma. The body was on the thinner side, but not in a disagreeable way, as cherry and dried black tea tannins coaxed on the lengthy finish. Softer and rounder as the night moved along, earth, tobacco and cedar plumped up each sip. Bright acidity kept things light, whilst a lingering cherry coiled me back around to the very beginning. Dipping its toes in two different pools, it darts between zingy acidity and thick earthy resoluteness, making for quite an engaging glass. Estate Bottled by Terredora Di Paolo S.S.A.